Saturday was such a fun day!! We picked up Drew, this was our first time to take him off the orphanage grounds. He rode with us, possibly his first car ride ever. We went to African Bagel Company, a beautiful home and grounds filled with ex-pats eating bagels and coffee. ABC is run by Robin and Rich Smith where they serve amazing food (doughnuts). Robin disciples the women who work there and teaches them life skills. We then went to Africa New Life where Saturday was sponsored child day. We have a couple sponsored kids, Jessica and Frank, that we got to meet and spend time with. That was SUCH a highlight. They seem to be doing really well and I was encouraged to see the tangible work ANLM is doing on the ground. We were able to bring them a few gifts and hug them and play with all the kids. Caroline was a hoot! She was surrounded by a zillion kids all wanting to ask her name, touch her hair and skin and stare at her. She LOVED it, all smiles. She loved meeting them and talking to them (but most speak Kynrwandaan) She was clearly a glowing white contrast to all the color! Drew did great in the Ergo on Andy's back and slept the whole time we were there. Andy was able to see Emmanuel, a 19 year old he met last year at ANLM and was able to sponsor this year through truck-driving school. He has done so well on his exams and now just has to pass the practical. He is so tender and I was thrilled to get to meet him after a year of hearing about him from Andy. We came back to the house for naps and were able to get Drew on his belly and in a home. He really came alive!! We were thrilled to see him interact so well relationally and physically to be so active, clapping his hands and feet and cooing. The Mears had some friends over for dinner, Jennifer and Dano Jakanovich. 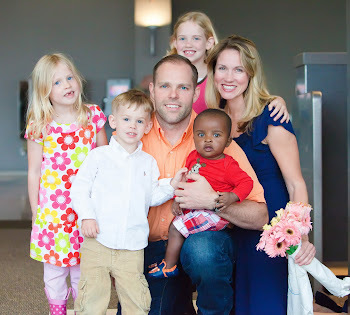 They have adopted 3, one from Rwanda, they are here with an NGO, and she volunteers at Home of Hope every Wednesday. She has an abundance of experience so I picked Jennifer's brain for three hours. What a wonderful day! Thank you for keeping us so updated... I love Drew already. He and Charlie can do their tummy time together. I can't wait for them to be friends. We're SO enjoying your videos! Thank you for sharing these moments with us. All the best as you continue the process this week. really enjoying the video stories! thank you for sharing, they mean a lot to those of us waiting! praying for your family (all 6). Love that y'all went to African Bagel Company! Robin baked HUGE cakes for our Women's Graduation in November...which was such a treat!! Loved seeing y'all with your sponsored children. And just am falling in love with Drew over and over and over again! Caroline's face could not have been more precious in the sea of Rwandan children at the Dream Center. My heart is just overflowing with joy for y'all. And love that we share this love together. Cannot wait to get my hands on Drew! PS--Aunt Elizabeth and I are grabbing lunch together tomorrow! LOVE YOU ALL! and i love seeing the photographs of you all finally together as a family! so excited for the road ahead. it looks like Drew is really coming alive! PS - Carol K sent me the link, she is one of my BFF's. And I know Lane. And Jessica of course. Reading all of these and crying... and maybe a tad jealous that you are with the Mears AND had dinner with Jennifer!!!! LONGING for him, now, my friend... can't wait to talk this journey together! meant to say "walk" this journey together, but of course it will involve lots of talking!